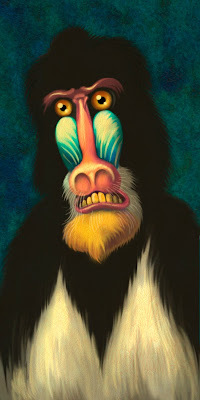 This week's entry for Ben Towle's Animal Alphabet is the Mandrill. This one demanded color & I only had time for a quickie, so it's completely digital (Photoshop.) I'd really love to work this up to a full-fledged painting someday. It makes me want a mandrill costume for next Halloween. I would really love to see you go back and tackle the earlier letters. Maybe you can do 2/3 of a second lap, after we get to Z? I saw the ‘m’ in the nose before it appeared in the chest. Clever thinking. Leah, I don't have Facebook or Twitter, but I'm trying to send you a message. Will you send me an email?